So with me taking a bit of time off watching motorsport, not much work has been done on the car this week, but..there's plenty of stuff I have not posted yet. One of the things I'd thought at least someone to notice, was the work done at back of the car. I mean there were more than enough hints in some of the pictures I posted. But apparently nobody dared to ask what I had really done to my Tail end Charly...the huge diffuser sticking out the back of the Ford. Ever since the ACO/FIA/IMSA aero rules changed a couple of years ago diffusers, almost bigger than those seen on LMP's have become a trade mark on the GTE/GT-LM class cars. And as such they've started to appear on slot-car models. Not that much of a problem on a stock chassis, but as we learned with the BMW M6 ....they can get you into trouble on a podded chassis with lots of suspension travel. The wishbone's connected to the collar bone, the collarbone is connected to? On a podded chassis with suspension, you max amount of suspension travel should ideally be smaller than the ground clearance your running. Other wise you chassis will rubb the track. No matter how long your screws are or how tall you springs are...your looking at 1-1,5 mm of travel max. But as the back of the chassis sticks out behind your suspension mounts...a small the amount of travel at the suspension mounts will be translated in to a bigger movement at the back. Meaning that if a lot of chassis is sticking out at the tail end...like on the Ford...it will be rubbing the track way before you get near 1,0mm of travel. So at the end of first shakedown on Sunday feb 10th there was one more test we needed to do. The "What if" I wanted to test was how the handling of the chassis would be influenced...if the diffuser was not connected to the chassis but mounted directly to the motorpod. As this would be a "no way back" kind of test, we first tested if the handling of the car became worse with the rear pod screws not connected to the chassis at all. The handling of the car remained the same...all we needed to do was ad some extra spacers inside the springs to limit the suspension travel. Ok ..so far so good, next step. Now it was time to cut the back of the chassis off and mount it fixed to the motorpod. Immediately we noticed that even with the full amount of suspension travel the diffuser was no longer rubbing the track. With a big smile I added the pod mounted diffuser to the number of modifications to be discussed the next day with Stefan Nalbach to be incorporated in the MK2 chassis design. On the left the diffuser cut of the prototype MK1 chassis here the diffuser was still mounted with screws from the bottom, on the right the MK2 version with the top mounted screws. Rubber washers were added for e bit off extra flexibility in case of a hard hit to the rear of the car. In just 21 days we should be arranging all the tables, chairs and the Marshalling floor mats @ Warwick college sports hall in Henley in Arden. With all the time and effort it takes to set up the 1/32nd DiSCA La Sarthe track a helping hand is always appreciated. Alex and Gary have a place for every bit of track and scenery firmly locked up in heads...(a couple of thousand items, but they do have a written manual to fall back on)...so we'll just be taking the dumb and heavy work of their hands. Before I start my builds I usually dismount all of them and store them safely in a box for later mounting or to use them to create masters for rubber casting or vacforming. To be honest I had a very hard time trying to get the mirrors off the body (as I wanted to recast them in rubber) noticed that they were quite flexible and upon closer inspection found them to be cast...in rubber! Well you shouldn't ! You should allow it to come off..at least in a hard crash. The rear wing has been designed as such that it clips into a mount and would come off in a hard crash..if not for a tiny drop of glue added in China. But that tiny drop of glue actually prevents the wing supports to come free in a hard crash and may result in breakage. So stick a thin scalpel next to the supports into the wing mount and wiggle to cut the glue and you're home free...but there's more. Once you have the wing off the car and flip it upside down you'll notice a seam line and that its actually cast in two parts: the rearwing supports and the top wing with the endplates. So again, take out you thin scalpel blade and carefully, and I do mean carefully (as in always point the sharp end of the blade away from you) try to pry it between the wing supports and the wing. Now on two of the three wings I have treated this way there were only small dabs of glue used to fix the support. I could easily pry the blade between them in the middel and wiggle my way with the scalpel to the sides and the wing would come off. But with one wing someone in China had been really thorough and more generous with the glue, couldn't get the blade in between. In that case I would advise you to leave it as it is and "just" be content with the "clip in" safety. But if you can separate the wing from the support and clean the recess from glue. Just a tiny bit of thin double sided tape or a small dab of shoe goo will give you an added safety feature to prevent breakage in case of a serious crash. Ok so back to that PM I had send, the one leading to a nice bit of team news. DiSCA sporting rules require all detail parts to be present on the cars. Small detail parts (like mirrors and wipers) only need to be present at the start, but wings need to be present at all times. Should they come off you'll get a notification from Race control and you'll need to Pit within 5 laps to replace it. Which (if your car is prepped for it) should not be a problem as by that time..a Marshall will kindly have placed the part in the "lost & found" bin at RC. And if the Marshall is bit a slow, you mount the spare and place the retrieved item in your spare parts box in the Parc Fermé... later. This procedure works well in the day time...but in the night darkness.... it may take a lot longer before the "lost" wing is retrieved...and some are "lost" ...forever. So it is handy if you have at least 3 or 4 spares. ... and ask Scalextric if they would be willing to "support" our effort with 2 or 3 spare wings and mirrors. ...and he would dig round the office and to see if they had any spare shells etc. etc. In the afternoon I got an email that he [/size]couldn't source any spare shells, but that 3 complete cars were now laying wrapped and ready to be shipped out in the post room. Way to go Scalextric, that's what I call "after sales service" You ask for 3 wings and mirrors and you get 3 complete cars, it was like Christmas all over again. And while we're talking decals, here's an other Team update: on the roof we'll also have decals with the names of Wayne and Stephen Lander listed as drivers of the #18 car. Just 24 days before the start of the first practice session in Henley in Arden. Looks like we're going to play catch up with Garage 27 for car prep. We've had a good test session last weekend in which we managed to do a lot of work and testing, not everything I had hoped we could do, but it was a very, very constructive day. First and foremost, we've now got a good base set up for the new MK2 chassis, that may look easy, but with a new chassis you basically start from scratch for 50%. And one those test days..time flies. But I'm getting ahead of the story, more on that part in a later post, because before we could go testing I first had to finish some parts. Marc was going to bring the Dental Vacform machine to Best (thx Eric) so we could pull some lightweight windows, meaning that I had to prep the masters. So here I go, its lego time again. Besides great for building the walls of your cast box, the little Lego pieces can also be used to support and fixate the position of the part you want to copy. Most important when they're fragile breakable parts like windows, even more important when those windows need to be fitted from the inside of the body..to maintain the correct shape and fit. You can actually see the top of the Lego sticking out of the bee wax. The Bee wax can be shaped cut and moulded with a knife, a spatula and even with your fingers. Its great stuff. It gets softer when warm and can be dissolved (as in when you need to clean the master again) with cleaning petrol. 1 that you seal your master completely, because even with the tiniest small gap between the master and the wax...the silicone will creep in between. 2 that you keep the master as pyramid shaped as possible. 3 that you maintain a clear definition on where your master ends, if needed you may need to go against the pyramid rule here, as long as the overhang is minimal. After bee waxing its time to build the cast box, and the to clean your master, and I mean clean, polish and remove every flint or dust particle that you can find. ...which in this case isn't such a bad thing... but that too is for a later post. I've covered casting the silicone before so I'll skip that part and head straight to the resin casting. Here (also due to time restraints) I used a very fast setting PU resin. Handy when you want to pour several casts in a couple of hours, but the down side of the fast stuff is... you've got a two minute window in which to mix the stuff and pour it into the silicone. .. and those would be detail parts like the thumbs and fingers of your driver or some delicate motor detail that took you hours to create on your master, or the bottom (and thus in the mould the top side) of your air intake. So before you start mixing your resin, have you silicone moulds laid out in sequence of casting, have a fair amount of kitchen towels ready for the Oooops! :wacko: moments. A spatula to wipe off the excess resin and most important..a couple of tooth picks. Now you can mix your resin, make sure you mix the minimal amount, as the more resin you mix in the cup the shorter your cast window will be. Don't worry about mixing too little for these type of masters. Resin sticks to resin like....well that would automatically be corrected here on SF, but believe me it bonds very well. So even when your mould isn't filled to the edge, just mix a bit more and complete the casting. So..about the work around to get the worst bubbles out...well its simple, as you can see in the pics above I use the tooth pick to pry them out of the deep parts in the mould. ...well off course it isn't that simple and it will take you several casts before you get it right as can be seen in the picture above right. Took me several pours to get one air intake without some air bubble caught in the mould. But the windows and headlight lenses came out perfectly. Ready for some Saturday afternoon vacforming. There was one more item that I had to fabricate for the MK2 chassis and that was a bracket to mate the Slot.it SW pod to the central front suspension mount we'd incorporated in the MK2 design. We'd used a similar design last year with the C7R for which Stefan Kievit designed a nice 3DP part, but although it worked very well, that bracket needed to be dis mounted from the motor pod if you wanted to change the O2 chip. For the Ford I wanted too keep it more simple, stronger and lighter. So I rumbled through my supply of GRP and cut this small (and if I may say elegant) bracket from a 1mm thick sheet. A Big head tall Slot.it suspension screw, some spacers and a 2mm bushing, a short Scaleauto spring and a Thunderslot top nut. The Slot.it SW motor mount had now been modified from a quad pod to a tripod with just on screw to set the front pod float, which can be done without taking the body off. Now we were ready for some serious test runs. Just 30 days before the start of the first practice session in Henley in Arden. With the MK2 Sidewinder chassis now on the bench, work in the last week was focussed on prepping the MK2 chassis and converting the MK1 chassis to a AW configuration. We've got a test session planned this Saturday where the goal is to give both chassis a thorough endurance test and compare both configurations. With all the post on detail bits and pieces of the Ford, I thought it would be a good idea to post an overview of the chassis "development" from the original ProSpeed chassis via the prototype Mk1 to the now almost ready for testing MK2 chassis. 3 images representing a lot off work done in the past 3 weeks. On the left the original ProSpeed design which more or less had the same shape as the Scalex Ford with the side skirts and diffuser attached to the chassis. In the middle the Mk1 prototype where I'd cut of the side skirts and diffuser and fabricated mounting points for the body support grubscrews and the side suspension. This is how we ran the Ford in the first two test runs. 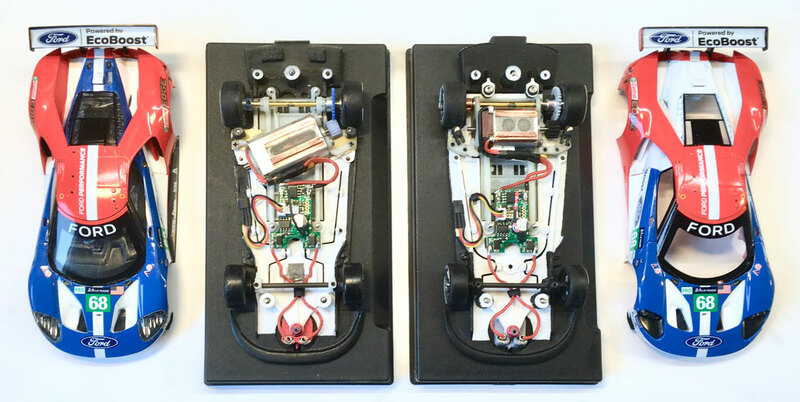 On the right the assembled MK2 chassis the with all the lessons learned and changes that were made "manually" to the MK1 now incorporated in the 3DP design. The main difference being the addition of some reinforcement ribs on the chassis to prevent the chassis from bottoming out in the middle, a different shape for the Flex slots in the chassis with the forward grub screws moved..forward. This was to make more room for the O2 chip. The differences between the MK1 and MK2 are more visible from below. As you can see the MK2 chassis is a dedicated SW chassis, wrapped tight around the the Slot.it pod. Besides the shape of the pod surround you'll also notice that the rear of the chassis has now been beefed up and now has a U-profile in which we can glue a kevlar strand for even more rigidity and crash resistance. Just behind the front axle is the mount for the front suspension bracket (which I still need to fabricate) that will turn the quad point slot.it pod in to a tripod. Last but not least, the guide has been moved forward by 1mm and the guide recess in the chassis has been enlarged so we can fit the Thunderslot guide with its wider and longer guide saddle. With the 2nd chassis almost ready to run it was time to start prepping a 2nd center body section. Wasn't to happy with the first one anyway, removed too much material and the modifications were a bit crude. But you learn from your mistakes so I.m.o. the MK2 center body is much neater and cleaner. Although we could in theory run the modified plastic parts....I do hope there will be time enough to cast the MK2 body centre section in silicone and laminate at least one GRP version. Last but not least, a bit of scale detail. I needed to make a 2nd set of front wheels for the MK2 chassis, had a good look at the stock scalex front wheels and they are actually pretty good. ...the Scalex wheel has scale spokes, no hub and insert. Modified some Black arrow brake disc which even when "lightly' coated with paint are not totally opaque and slid them over the wheel hub. So there you have it, both Ford GT's side by side. Although the MK2 is a good step forward (at least that's what I hope saturday's test will confirm) we'll most likely be racing a MK3 version in Henley with some minor detail changes and some extra 3DP bits & pieces. To finish off my previous post on how to modify a Slot.it SW pod...here's one on an idiot proof way to set a proper gear mesh and axle play. With motor, pinion, axle and gear mounted. Insert a piece of paper or a plastic zip bag between the pinion and gear. Push the motor tight towards the rear axle/gear and tighten the front motor screw. Not fully, just enough to fix the motor position. 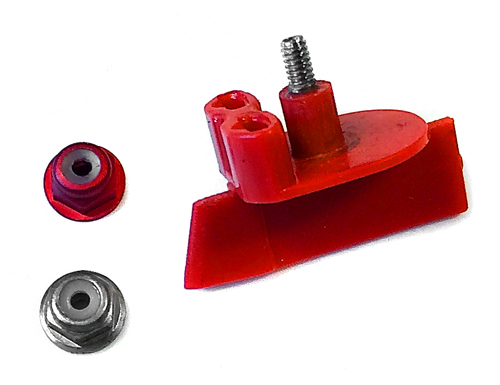 Get your axle play adjuster tool (the H-shaped parts) from the PA47 or PA52 slot.it axle spacer set. Remount gear and insert tool between gear and spacer. Squeeze/press gear tight on axle to eliminate any axle play. Tighten gear grubscrew. If you use 2 grub screws tighten one side lightly to fix position of gear, rotate gear 180˚ tighten 2nd grub lightly, rotate gear 180˚ tighten 1st grub more, etc etc. So there you have it, an idiot proof procedure to set the same and correct amount of axle play and have a perfect gear mesh, any time, every time. As usual the most simple ideas can be the most ingenious ones, and by adding the axle play tool to the PE spacer set a Slot.it PA47 and/or PA52 is really one of the best buys you can make. The Road to Le Mans 1/32: 5 weeks and counting. How to modify a Slot.it SW pod for ballbearings and multiple gear & pinion combinations. 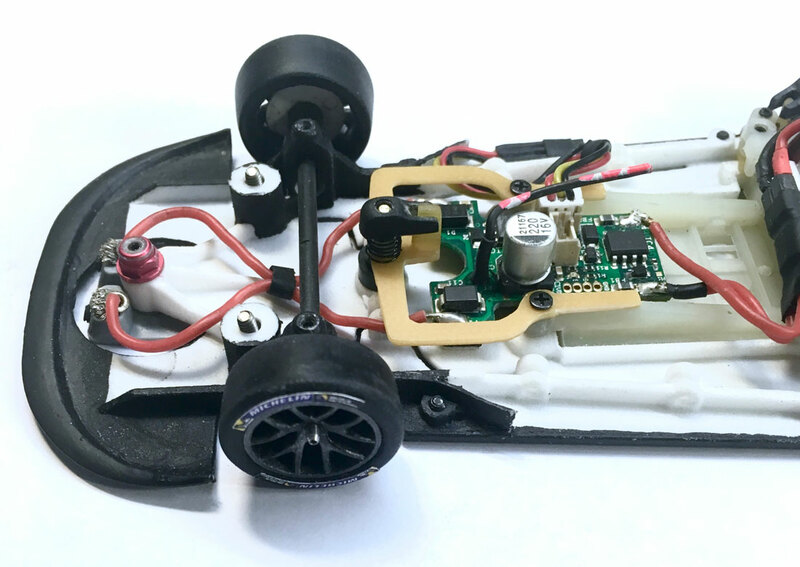 Light, compact and offering great handling, these are the main characteristics why running a Sidewinder motor has become the popular choice for DiSCA spec GT's. They have but two minor disadvantages that with a bit of handy work are easily to overcome. 1: You can run but two gear/pinion combinations: 6,5mmø pinion with 18mmø gears or 5,5mmø pinion with 19mmø gears. 2: Due to the close proximity of the rear axle to the motor magnets there is some magnetic drag on the rear axle. a reduced diameter centre section which provides more clearance between your motor and the axle. But with it being "just' 54mm wide it can be a bit short. If you need a wider rear axle your other option would be to use a 55mm Titanium rear axle as available from Scaleauto and Slotingplus. The advantage (besides them being of a non magnetic alloy) is that they are light, the disadvantage is that they are a bit softer than the hardened steel axles. Meaning you would prefer to run them in ballbearings rather than the regular slot.it olites. the one on the other side. As you repeat this process several times using a 0,1mm bigger drill every time..it does help to switch sides every two or three passes. and if you source them from other brands..that's the diameter you'll be looking for) The next step is to grind away the outer part of the olite holders. You can grind them perfectly flat with the rest of the pod but I prefer to keep 0,1mm as it will be easier to align the ballbearings later on. Clean up any burr's left on the pod with the reamer or a sharp knife. As I mentioned before, the lowest gear ratio with stock gears is 2.38 which means that on the longer straights of some of the DiCSA events your Vmax will be limited. If you want to run a lower ratio you'll be looking at different gears & pinions with different dimensions. This is not an exact value of the distance between the pinion and the gear (as there's an overlap etc etc) but its a good value to compare possible other pinion and gear combinations. If you want to go lower, then you could use the 17,5mmø NSR gears, although you will have to ream these to fit on the titanium axles. But you'll have ratios going down to 2.0 with a 28t gear. 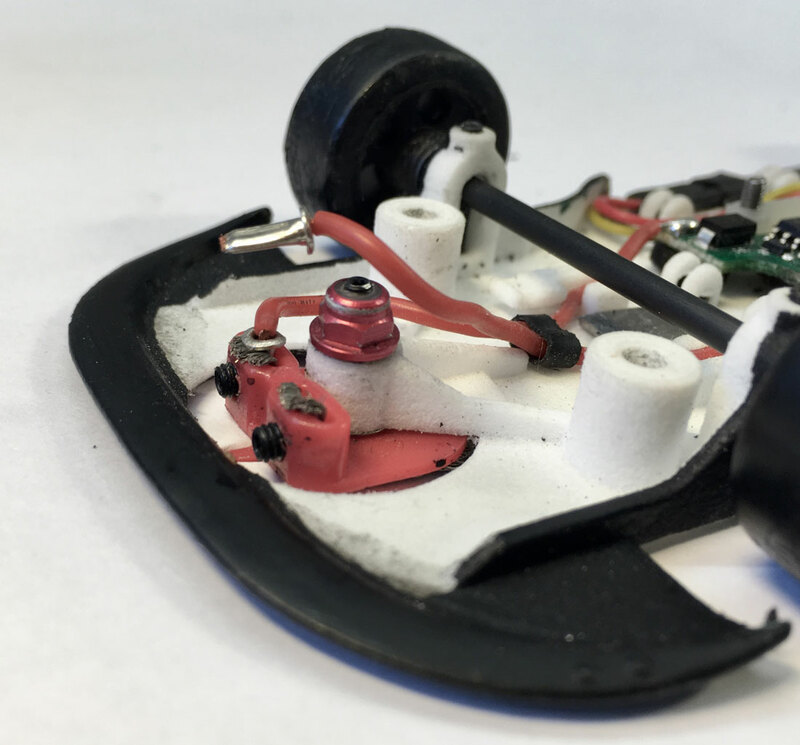 With a 2.0 ratio you are approaching the limits on what a MX16 small can can accelerate and decelerate on a 72-78gr Slotcar. But for the long Mulsanne straight a bit of extra top speed might give you that little edge. For my cars I prefer to use bigger nylon pinions and even when the sizes with your mixed brand pinion & gear combinations do match, your mesh might still be a bit off. 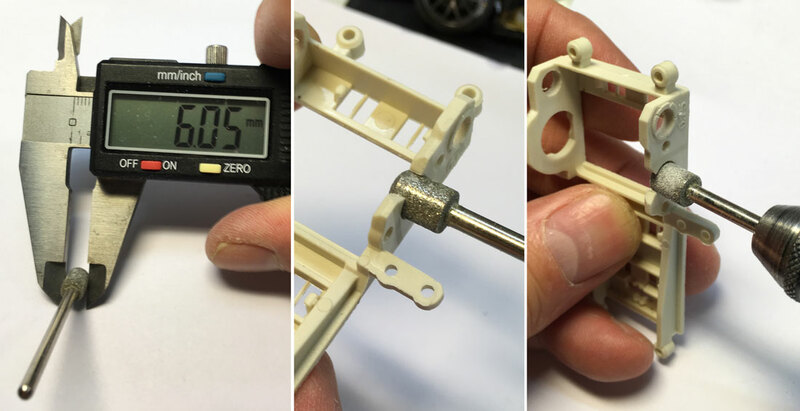 So below are some images that can show you how you can give your pinion that little bit of wiggle room needed to adjust your mesh. 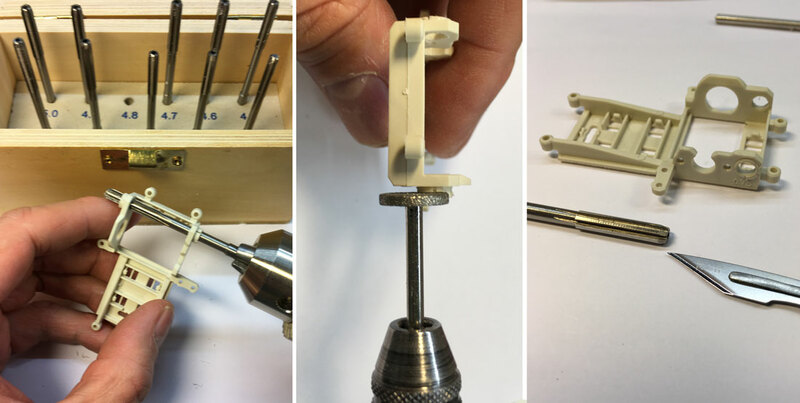 So what you'll be looking for is grinding tool with a 6,0mmø, what you'll be needing to do is to enlarge the opening in the pod for the Motor bearing by 0,5mm forward and backwards. Again use the slowest speed possible on your power tool to keep good control of where you're grinding material away. As you can see below I also grind away some material of the top of the pod, this is done to make it easier to snap the motor in the pod..and reduces the amount you'll deform the pod by doing so. I usually wait with aligning the ballbearings till after I've mounted the motor (as this will deform the pod a tiny bit) I use 2 short motor screws to secure the motor. Best procedure is to use the front screw to adjust the mesh (with axle and gear in place). Tighten it and then remove the gear to be able to insert and tighten the rear screw. The reason why I prefer to use Torqx screws should be obvious..they don't fall off your screwdriver that easily. So there you have it, with these mods you'll have an adjustable pod that accepts pinion/gear combinations within a 24 - 25mm range. This is a copy of an answer I gave in an other forum about Wire to guide insertion The question was what method slotters preferred to insert their lead wires into the guid: Eyelets or grubscrews? With al the (endurance) testing for the DISCA LM 24hrs I have come to the following best procedure (I.m.o) a combination of both. Pitcured below is a modified Scaleauto guide with self drilled and threaded holes for the M 2,5 grubs. With the eyelets crimped you gain the rigidity of material for the grub screw to press on, but keep the full flexibility of the lead wire. With tinned lead wire ends it is hard to control how far the tinn gets sucked into the lead wire, which can create a rigid and thus break point in the wire. M2 grubs, specially those with a pointed tip are more likely to split, cut of even miss the lead wire all together during a quick pit stop than the broader (flat) tip of a M2,5 grub. But yes you do need to drill the hole and thread it carefully, but when done well no splitting of the guide... that is unless you over tighten the grubscrew. ....The way I treat my guides is a crossover from the world of 1/24 racing where you use guides with a threaded stem and a guide nut. Ok what you're looking at is a Scaleauto guide with a 6mm grubb screw and a M2 aluminium locknut. You can get these from Conrad in aluminium or anodised red and blue. The reasoning behind me using this system is that with the regular 1/32 guide screws you have no way to lock the screw in its position. Its eather tight or not, if you want to give your guide a bit of guide float you have to use a longer screw. Screwing them in, in excatly the same way and perfectly straight every time is very hard to do. By inserting a grub screw in the guide stem you only need to get it right once. I use a m2 thread cutter to thread the hole of the guide stem, and as the cutter has a long handle its easy to get that perfectly straight and aligned. With the metric thread you get a much finer adjustability and the nut serves a dual purpose. even when the guide holder is a bit wider than the guide stem. And as its a lock nut its position remains fixed, no matter how much guide float I set. As this is applicable to all cars, and not just the Ford GT. Another week has flown by, work on the Ford is making good progress, but I'm running seriously behind with my post updates. Last week I finished the master of the cockpit, vacformed the first prototype and ran a second test in Best, checking the modified body for any clearance issues with the modified chassis. But let's pick up where I left with my last post. As I mentioned before, the stock Scalex interior was lacking a bit of detail..and half of the driver ..not to mention the rudimentary driver seat. On almost all slot cars the driver and his position in the car are hideously incorrect and when they make a vacformed version of the stock interior most of them will look like shapeless..blobs. Seems like if you want to save a bit of weight you should not care on how it looks...well.... I do. With all the space you need for the chassis bits (not to mention the Oxygen Chip) there's no way to replicate the depth of the interior in true scale, so its more about creating a suggestion of depth and detail. Doesn't take much to do so, a few rectangles of styrene, some wires here and there. I'd collected tons of reference images..but in the end you just have to wing it. It does help that on contemporary Sportscars the seats are thick and well padded. And with the HANS devices the helmet and driver have got a vacformable shape. A bit of putty here and there to properly "seat" the driver, used some thin foam I had in my bin box for the padding. Below the various steps I made to make casts of the masters. Your never to old to play with Lego, excellent stuff to make cast boxes, yeh they will leak a bit, but nothing too bad. More important when you make vacformed masters is to keep in mind they have to be pear shaped, or beter pyramide shaped. They have to be wider at the bottom than at the top..otherwise you won't be able to get the master out of the vac-formed PET. A trick to help you go pear shaped when obviously your master is not...is to mount the mater at an angle in the Cast box. Lean the interior backwards to capture the most of the dash and driver detail. Same goes for the Motor compartment, Slightly tilted backward so I can vacform both sides of the firewall. Negative mold to cast positive master. So here's a picture of the "negative" silicone mold and the positive resin cast, looks nice and clean, but its actually a messy business. Unfortunately my resin was way over date so I needed to add more harder for it so set which meant more air captured in the cast and several cast to get a few decent ones. But for the first test it would do. Hello guys, just seven weeks till the start fo free practice, time for a quick update, as mentioned in my last post this week's work focussed on getting the masters for the vacformed parts ready for silicone casting. Stock Scalex interior tray, already with serious chunks dremmeled away, Scalex Motor detail and half of driver seriously lacking. On the left Stock Scalex driver now with legs and new tray for motor compartment, on the right with new seat and all Motor detail added. On the left , right side view of interior , on the right interior split up in parts to be vacformed separately. First and probably last time anyone will see the scratch build intake manifold, but at least I'll know its there. Finally have a short moment to post an update, its been a busy week and a half, spend most of my free time in the "workshop" getting the Ford ready for its first shakedown. That clock just keeps on ticking. Most of last weeks work was focussed on categorizing and analyzing what body and chassis modifications needed to be done to fit the chosen race set-upand then implementing them on the first Prototype chassis. So it won't be much of a surprise for most of you to see the first pics of the Mark I chassis with a slot.it sidewinder pod. I'll be building on the experience gained in the last two editions with the DiSCA Proton Porsche and the SRFH Corvette C7R. So the first thing I always do when I start a new project is to open a new excel sheet and take stock, I've got one for every car I've build in the last 4 years. Each data sheet contains all the parts used for the car during the build & testing and the race(s). It list part nr, dimensions and most important their weight. With most of the specs for the running gear pretty much at a constant, the sheet allows me to calculate what consequences a specific a set-up will have on the weight of the car. But for each car the chassis and certainly the body can be very different. So here I usually start with noting down the values for the Stock parts (if there is a stock base car) in the first column and set target values in the last. During the build a new column is added for each test so I can keep track what progress (if any) has been made. Taking stock also helps with making plans as it becomes pretty obvious where the biggest gains can be made. With a target weight of 16 gr (need 3gr for lights) the Ford is pretty good to begin with. Ditching the rear wing support section for something lighter and a vacformed interior and we're a good way towards our target. But because the Ford has such a small and low body I won't be able to make such serious weight gains as I did with the Carrera M6. ​So like very other car I've build to DiSCA spec..every 10th of a gram will matter. Besides making masters for Vacformed parts, modifying the body to make room for the SW configuration will also needed to be done. In my "S- can conversion" post I mentioned that little or no body mods would het been required for Scalextric to have fitted their regular S-can. And that even a SW configuration would have been possible...for a Stock chassis. But for a DiSCA spec car with offset pods and 1 -1,5 mm suspension travel..its a different story. One one of the reasons why the Ford became our plan B was that besides a Scalex base car I also had a ProSpeed 3DP chassis. Although its designed to be compatible with slot.it pods it did not have any pick up points for the Evo-6 springs. But like with the M6, Stefan was willing to incorporate any changes I would need in new chassis versions. So the first thing I did was add another layer of on top of the rear of the chassis, covering the general area where I thought the suspension and body adjust screws could be placed. Using 1,5 mm thick plasticard this would give me enough "depth" to countersunk the suspension screws. I've always been a fan of side suspension when running on Ninco, and the wider I can spread my suspension points the better. So the good news with the Ford was that (unlike most other GT's) the wide Evo spring arms do fit under the body. The bad news was that there's no room to mount any spring on top. So I went through my spares box and dug up varies springs and suspension bits and pieces. The shape of the body and the pod more or less dictated where I would be able to mount the springs. So here are the suspension adaptors I fabricated from 1mm GRP, just thick enough to cut a thread in so I could mount them with grub-screws (lighter then normal screws cause they have no head) to the OEM slot.it mounts. And just thin evenough to slide between the chassis and the suspension arms. Must say easier said than done. Although officially you could call these adaptors Mark I, I must have fabricated, and oops dropped on the floor and lost for ever..half a dozen of these tiny parts. A very interesting feature of the Scalex Ford GT is that they've conveniently designed their casting, separating the body in an outer and inner body shell. Conveniently as it was very helpful to just be able to use the inner body shell dismounting it a zillion times to see if it fits, and if not..where it rubs. An oh boy did it rub. On the workbench all looks fine with plenty of clearance, but on the track with all the body float and pod travel everything would start to foil and hinder free movement. No matter what I tried, I could not get the radiators to clear the top suspension nuts, so they had to move, or more accurately they had to rotate a bit. Below you can see how I cut them of the inner shell and remounted them at an slight upward angle. Now I had room enough for the suspension mounts with their top nuts to move freely. Ok that's it for now, got more work planned for 2 night, got a master for the interior to finish, mould and cast. As a preview of post to come.....see pic below..cause yes...I did manage to finish the Ford GTLM Mark 1 for last Sunday's roll out and shakedown. make no mistake, the third generation Ford GT was conceived, designed and built with one priority in mind: Win the 24 Hours of Le Mans on the 50th anniversary of Ford’s fabled victory at le Sarthe in 1966. So for that one..mission accomplished. with plenty of of help from a 3.6 liter, twin turbo Ecoboost V6 engine producing 530 horsepower and 494 ft-lb torque. Some may say that by doing so Ford has moved the goal post in GT "beyond" what was intended by the "spirit of the rules". That it is a prototype clad in GT bodywork.  In any case the combination delivered a dramatic Le Mans win in the car’s inaugural campaign, along with several other victories in World Endurance Cup and IMSA competition, indelibly stamping the Ford GT as worthy successor to its legendary namesake...and that of other goal post movers like the (mid engined) Porsche 911 evo and Toyota TS020 GT-One of two decades ago. With such a new Icon on the racetracks it didn't take long before both the major players in the slot, Carrera and Scalextric announced that they would do the GT LM. As did the small volume 3DP manufacturers The Area 71 and Arrow slot. With both of them acquiring and entry for the 2017 Oxygen LM 24hrs it was the latter that was to give the Ford GT its debut in DiSCA competition (TA71 withdrew its entry two months for the race). Alas no copy of a debut victory like its big brother. 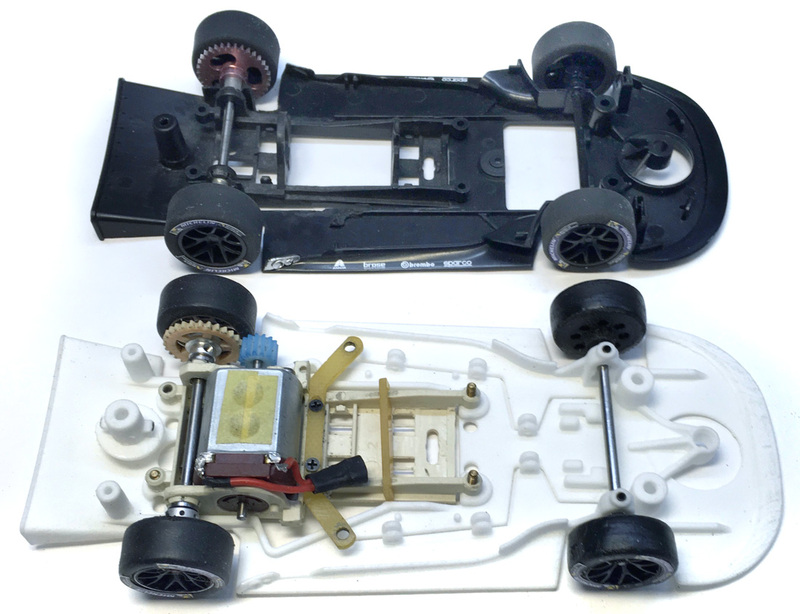 The Arrow slot Ford faired well, the 3D printed body and chassis finishing second in class and 5th overall, but major succes came a year later when Spanish team Ditslot i3D entered a development 3DP chassis with simple slot.it pod and a similar 3DP body. They not only took first in class but also 1st place overall. 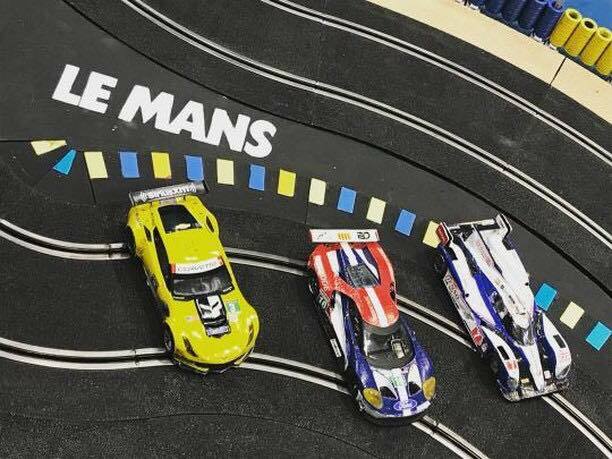 Does this make the Ford GT LM an absolute winner in the slots as well? Well it definitely has potential, its low, wide and has a long wheelbase. With slotcars in general running with the same engines and weights that's definitely an advantage. But Ditslot i3D did not claim its victory by having a much fast(er) car. By times our Corvette C7R was faster and by a large margin Rockingham's Toyota LMP1 had the legs on the Ford GT.. at least over a single lap. The true merit of the Iberian team was its incredible consistency, punching out fast times lap after lap (with a slight punch left right and center), staying on track all the time and only pitting half a dozen times to change tires. It was an impressive Team result, not specifically down to the fast pace of the Ford itself. As I post this its just 9 weeks till the 8th edition of the DiSCA Le Mans 24hrs, some of you that have read my other post will know that for the past six months "my road" to Le Mans was heading in a totally different direction, or should I say a totally different car. Although good progress has been made on the BMW M8 GTE project, the M6 GT LM test car winning its class and 3rd overall @ the Suzuka 6hrs, we've got some the delays on the M8 that will curtail the R&D program to such an extent that we decided to switch to plan B. And Plan B is to stick the #18 on the #68 Ford GT-LM and run that car @ the Le Mans 24hrs. Here's an "artist impression" on what's going to be the #18 Ford Monkeytown Team NL Ford GT-LM.